As the days grow short and chill, we grow more reflective. Time for a little serious reading by the wood burning (or gas) fireplace. So sit back with a cup of steaming hot chocolate, latte or tea, and let's read. 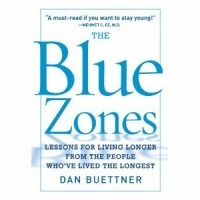 Before writing down that inevitable list of resolutions for the upcoming New Year, it might be helpful to first check out Buettner’s 2008 NYT bestseller ‘The Blue Zones’. In 2005 Buettner wrote a cover story for National Geographic in which he discussed three areas around the world which held concentrations of people living very long lives. These areas were called ‘Blue Zones’. Intrigued by what he learned, Buettner subsequently teamed up with scientists and demographers from the National Institute of Aging in order to lead a deeper investigation into these “longevity hotspots”. Recent scientific research suggests that longevity is only partially determined by genetics; indeed 75% of how long a person lives is a result of lifestyle choices. So if you’re interested in living to a happy and healthy old age, put down that Big Mac and pick up a copy of ‘The Blue Zones’. The book concentrates on four Blue Zones located in Sardinia, Okinawa, Costa Rica, and Loma Linda, California. And while centenarians are the fastest growing segment of the population, Buettner is not interested only in people who live a long time. It is the quality of that life – not merely the length of it – that warrants his interest. Very few people have a desire to live to be 100 years old if that means an existence marked by pain, dementia, poor health, and loneliness. The centenarians Buettner encounters are robust individuals in possession of remarkable physical and mental faculties, and who are still actively engaged in the community and the family. So if you’re wondering how they did it – and how to apply it to your own life – this is the book for you. Buettner divides the book into sections for each Blue Zone, closing these chapters with a breakdown of the ‘secrets’ contributing to that area’s longevity. For example, one of the things responsible for Sardinian long lives is a daily intake of red wine. But the Seventh Day Adventists of Loma Linda abstain from alcohol, so this does not factor into their longevity; however a high consumption of nuts does. Never fear though. The book again and again uncovers common elements that seem to be responsible for such healthy long lives: e.g. moderation in all things, daily exercise, a low consumption of meat, and a sense of purpose. Like many Christians, I first read the Bible either in catechism or Sunday school. And I didn’t read the Bible cover to cover until I was an adult; when I did it was with a critical eye. I was long past the age when I would be satisfied with an easy answer to the question: “Who wrote the Bible?” As a child, the easy answer was “God”; later it was modified to “men inspired by God.” But I wanted to know specifics -- how did the books of the Bible come to be written, translated, collected and distributed? What was left out, what mistakenly added or misinterpreted? Above all, as a trained historian, I wanted to understand the historical context in which these texts were written. Looking back, I probably should have become a Biblical scholar, but luckily many such scholars have written books that answer my still valid questions. One such scholar is Bart D. Ehrman, the author of ‘Jesus, Interrupted’ and his earlier work ‘Misquoting Jesus’. A former evangelical Christian, Ehrman began his theological studies at Princeton convinced that the viewpoint he had been trained in during his years at a fundamentalist Bible college was the only correct one. He was shocked to discover that he was wrong. Ehrman writes: “As a result, not only are most Americans (increasingly) ignorant of the contents of the Bible, but they are almost completely in the dark about what scholars have been saying about the Bible for the past two centuries. This book is meant to help redress that problem…For all those who aspire to being well educated, knowledgeable, and informed about our civilization’s most important book, that has to change”. Ehrman isn’t out to dissuade anyone from his or her religious beliefs. His last section describes how the discoveries of biblical scholarship do not have to mean a loss of faith. But he does want laypeople to learn what scholars, theologians, and ministers have known about the Bible for a very long time. It is riddled with inconsistencies, discrepancies, contradictions and irreconcilable differences, many of which Ehrman discusses. He also explains why such contradictions exist. And since Ehrman’s field of expertise is the New Testament, that is where he focuses his attention. For example, it may come as a surprise to many Christians that no one really knows who wrote the books of the New Testament. Certainly Mark, Luke, Matthew and John did not write the gospels bearing their names; they were written decades after the deaths of these individuals. And each of these gospels is written with a completely different viewpoint of who Jesus was, and what it means to be saved. Ehrman goes into detail explaining when these books were first put together, and for what purpose. Scholars conclude that out of the 27 books of the New Testament, most likely only the seven letters of Paul and John’s Revelation were written by the authors ascribed to them. And it is not known which John wrote Revelation, only that a person called John wrote it. He also discusses the different interpretations of what people of that time meant by ‘messiah’, and describes the apocalyptic preachers who were so prevalent at the time of Jesus, who was only one among many such preachers. If you’re interested in why one gospel places Jesus’ birth in Nazareth, and another in Bethlehem, Ehrman will explain it to you. He’ll also touch on the endless problems of translating text from one language to another. One such example is Ehrman’s demonstration of how a textual mistranslation lay the groundwork for the necessity of the virgin birth. And every educated person should understand how, when and why anti-Semitism raised its very ugly head in the Christian community. 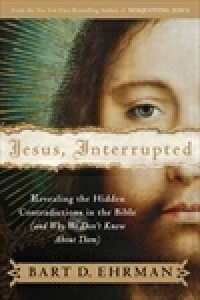 Or as Ehrman asks, “How did the passionately Jewish religion of Jesus become the virulently anti-Jewish religion of its followers?” Fortunately, ‘Jesus, Interrupted’ answers that question. When I taught Western Civilization in college, I devoted an entire three-hour lecture to the rise of Christianity. If Ehrman’s book had been published then, it would have been required reading for my class. Winter is the perfect time to read this riveting novel, which begins with the sentence “It was bitter cold, the air electric with all that had not happened yet.” Rest assured, a great deal will happen before the story comes to a close. The book opens in 1907 as Ralph Truitt, a wealthy but lonely businessman, is waiting on a train platform in snowy rural Wisconsin. He is there to meet the woman who answered his advertisement for ‘a reliable wife’. It will be both his blessing and his curse that this woman is Catherine Land, who replied to his ad by claiming “I am a simple honest woman.” She is neither. In fact, both main characters are highly complex. If you’re expecting a generically appealing hero and heroine, filled with a few quirky faults, this is not the book for you. Truitt and Catherine are often remarkably unlikable, but they are always fascinating and all too human. The novel begins in a slightly stylized fashion, but hang on. Give this haunting, suspenseful story a little time to work its dark spell. This is a novel of guilty secrets, murder, betrayal, greed, and last – but not least – redemption. ‘A Reliable Wife’ should probably be classified as a literary novel, albeit one with juicy elements like passion and murder. Having heard that the film rights have been sold, I can easily see how this story would translate well to the big screen. However a movie couldn’t hope to capture the cool perfection of Goolrick’s prose. 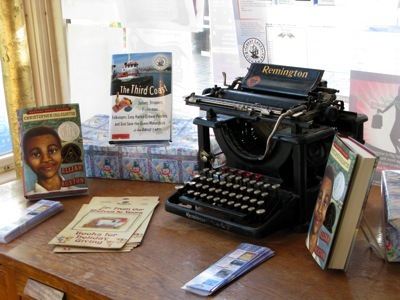 Although Goolrick has previously written a book of memoirs, ‘A Reliable Wife’ is his first novel. Well, I haven’t read a first novel this superbly written since 1997’s ‘Heart and Bones’ by Margaret Lawrence. As a novelist myself, I was simply dumbstruck by his command of the form. 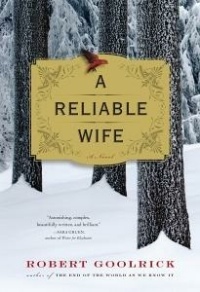 ‘A Reliable Wife’ masters every novelistic element: emotion, depth of character, complex plotline, and above all, prose that can only be described as beautiful. Goolrick is a ‘writer’s’ writer and perhaps only other writers can appreciate just how damned good he is. I’ve read a number of reviews since this novel has been published, and it seems that readers either love the book, or absolutely hate it. Well, to each his own, but if you don’t find ‘A Reliable Wife’ mesmerizing, then the rest of us might as well give up and leave the publishing field to diet books and celebrity biographies. Honestly I don’t know how you can expect anyone to tell a story better. This is one hell of a well-written book. And I, for one, can’t wait for his second novel. And for some lighter winter reading fare, here are recommendations from Meg Mims. 1999 - Harper 384 pages. You have to read at least one Terry Pratchett book in your lifetime. His satire is wry, dry and yet hilarious at the same time. His ‘Discworld’ setting is also unusual, and anyone can pluck any book in the series and find themselves thrown into the deep end without much explanation. Patience has its own reward, though. Pratchett hooks you with his cultural “parody theme of the book” and reveals information slowly, in a breadcrumbs-along-the-path way. By the time you realize you’re deep in a bewildering maze, you can’t help but hang in there with him. The adventure is in discovering the who, the what and the why, along with the interesting twists of his sharp sword to cut through to the core of cultural meaning. If you’re easily annoyed, it might help to check out Pratchett’s website to learn about the origins of ‘Discworld’ and some of the characters first. 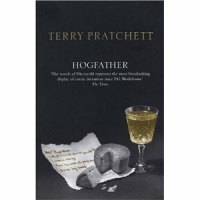 What else would you choose but Pratchett’s Hogfather for an entertaining Christmas read? Someone’s behind the plot to assassinate the Hogfather, a St. Nick figure who rides around in a sled pulled by four boars. Since someone has to take over his job or risk the end of the world, Death steps in—and hilarity follows. If you’re looking for a stress-reliever, escape into this unique tale of Hogfather. 1997 - HarperCollins 128 pages. Ages 9-12. This hilarious chapter book, while short, is geared for advanced readers from 9-14 years old. 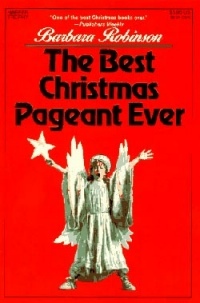 Robinson created a real wild bunch of kids in the Herdmans—six lying, stealing, cheating, blackmailing hooligans who terrorize the other kids in school in order to take all the best parts in the annual Christmas Pageant. The adults are naturally horrified, but surprising results come about—and a good lesson about the true spirit of love and joy, if not peace. 2002 - Dial 32 pages. Ages 3-7. The illustrations alone in this picture book will entertain the youngest toddlers of three or four. 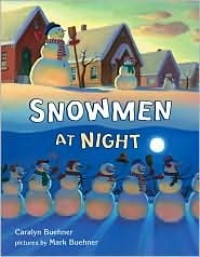 Five through seven-year-olds will love the action-packed rhyming text, which offers a fun and frolicking vision of why a snowman might look so worn and tired in the morning. This book makes a perfect Christmas or winter birthday gift. Read it to children at bedtime, and they may want to join the snowmen in their dreams!